How was the Monitor system tested? 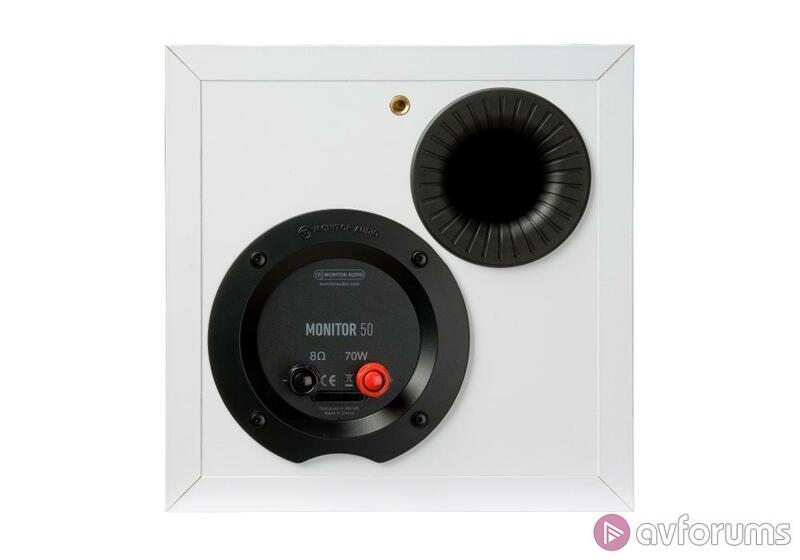 The Monitor Audio Monitor is the latest range of speakers from the company, and is designed to sit below the Bronze range as a budget alternative. Monitor Audio has previously used precious metals to denote its different speaker line-ups, including the aforementioned Bronze, as well as Silver and Gold. However, more recently it's moved away from that habit with the high-end Studios and the entry-level Monitors. 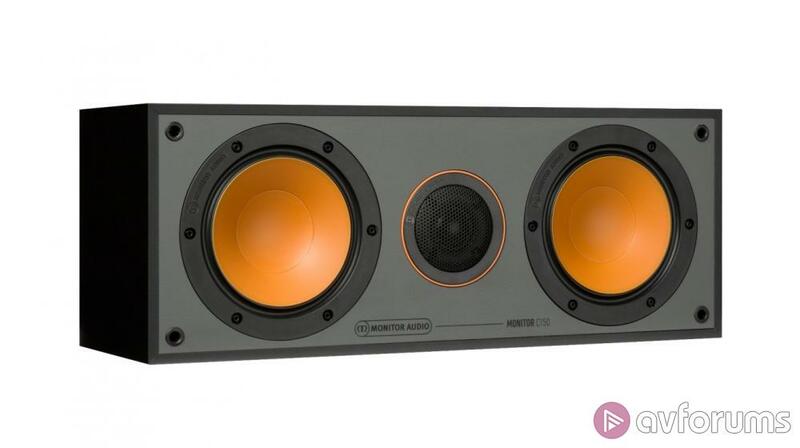 Confusing moniker aside, the Monitors are an interesting proposition, with a cheaper price point and eye-catching, if rather divisive, orange drivers that promise Monitor Audio performance at a very competitive price point. The 5.1-channel system in this review is based around the Monitor 200 floorstanders, the Monitor C150 centre speaker, a pair of Monitor 50 standmounts, and the MRW-10 subwoofer. The entire system will only set you back £1,050, so, if Monitor Audio hasn't cut too many corners to reach that price and can still deliver its usual level of performance, the company could be on to a winner. The Monitor Audio Monitor 200 is a floorstanding speaker that incorporates innovations trickled down from the company's award-winning Bronze range. 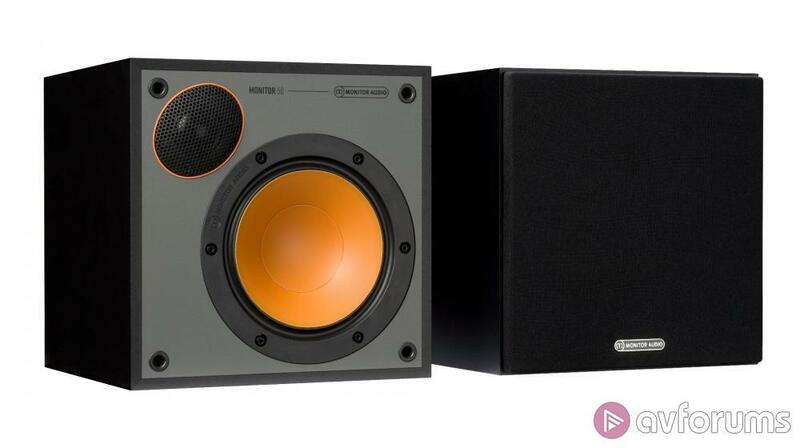 The Monitor 200 uses a 25mm C-CAM (Ceramic-Coated Aluminium Magnesium) dome tweeter, an orange translucent 5 1/2” MMP II (Metal Matrix Polymer) bass/midrange driver, and a matching bass driver. The cabinet has a dual chamber construction and there are two bass ports at the rear – one at the top and one towards the bottom. These ports use HiVe II (High Velocity, Low Noise Reflex Port) technology that’s designed to improve the transient response and tighten the bass. The Monitor 200 has a nominal impedance of 8Ω, a claimed frequency response of 40Hz to 30kHz, and a claimed sensitivity of 88dB. The Monitors are some the plainest speakers in recent memory, with a very simple design. Perhaps in recognition of this fact, Monitor Audio has added orange drivers and an orange trim around the tweeters to give the design a "playful twist" (as the company puts it). 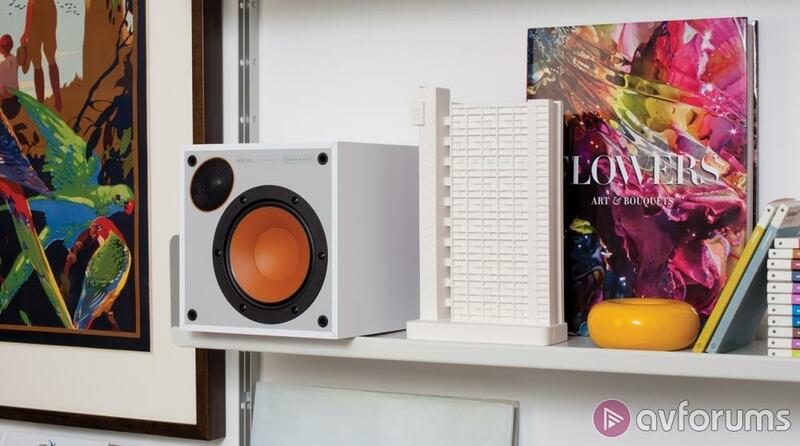 These design touches will undoubtedly be divisive and, while beauty is in the eye of the beholder, they make these budget speakers look cheaper than they actually are. Monitor Audio has cut a few corners, but overall the build quality is better than the impression given by the design. The Monitor 200, and the rest of the range, has a simple MDF construction with a grey baffle and a choice of black, white or walnut matte finishes. There are also black fabric grilles, which use fasteners rather than magnets to attach to the baffle. These floorstanders also include outrigger feet to improve stability, and there are two sets of binding posts for those who still like to bi-wire. The Monitor 200 measures 174 x 850 x 299mm (WxHxD), weighs in at 10.8kg, and costs £400 a pair. The orange drivers may add a 'playful twist' but they are not the new black! The Monitor Audio Monitor C150 is a dedicated centre speaker that has been designed to tonally match the other speakers in the range. Like the Monitor 200, the Monitor C150 uses two 5 1/2” MMP II bass/midrange drivers positioned either side of a 25mm C-CAM tweeter, in a horizontal alignment. The cabinet is sealed, has a nominal impedance of 8Ω, a claimed sensitivity of 88 dB, and a claimed frequency response of 60Hz to 30kHz. The Monitor C150 uses the same MDF construction and grey baffle, with the same choice of black, white or walnut matte finishes. The black fabric grille also uses fasteners rather than magnets, but there is only one set of binding posts at the rear. The Monitor C150 measures 455 x 174 x 188mm (WxHxD), weighs in at 5.4kg, and retails for £140. 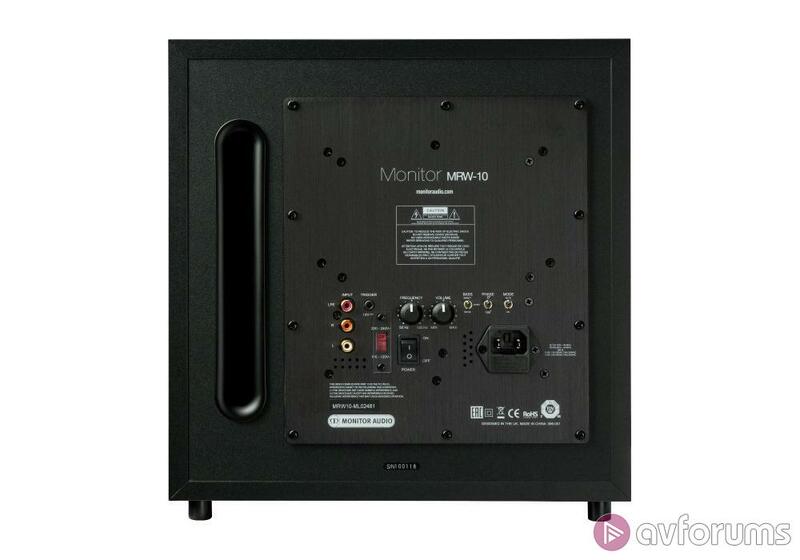 The Monitor Audio Monitor 50 has already been reviewed on AVForums in its capacity as a pair of stereo standmount speakers. Its cabinet is a cube, which is unusual, and the speaker uses a single 25mm C-CAM tweeter and 5 1/2” MMP II bass/midrange driver. The tweeter is positioned in the top corner (with each speaker in the pair mirroring the other), to reduce the size of the cabinet. The nominal impedance is 8Ω, the claimed frequency response is 55Hz to 30kHz, and the claimed sensitivity is 87dB. The cabinet is rear ported, allowing the Monitor 50 to perform in more confined locations, and there’s also a screw fitting at the rear for wall mounting. The speaker cabinet uses MDF construction and the same grey baffle as the rest of the range, along with same choice of black, white or walnut matte finishes. The black fabric grille also uses fasteners, and there is only one set of binding posts at the rear. The Monitor 50 measures 260 x 206 x 238mm (WxHxD), weighs 3.5kg, and costs £160 a pair. Finally, there's the Monitor Audio Monitor MRW-10 active subwoofer. This uses a 10-inch MMP II long throw driver, mounted in a rigid 18mm thick MDF cabinet that has rear porting. An onboard 100W Class D amplifier provides the low-end grunt, and the sub has a claimed frequency response of 30 to 120Hz. The rear connections are composed of two stereo RCA inputs, an LFE RCA input, and a 12V trigger. The styling is the same as the rest of the range, with a grey baffle, a choice of black, white or walnut matte finishes, and a black fabric grille fitted with fasteners. The controls are fairly basic, with three pre-set EQ mode settings (Music, Movie, Impact) to offer a level of adjustment for different rooms and tastes. The Monitor MRW-10 measures 320 x 336 x 351mm (WxHxD), weighs 10.5kg and sells for £350. I tested the Monitor Audio Monitor 5.1-channel speaker system in my dedicated home cinema. I positioned the Monitor 200 floorstanders at the front of the room on either side of my projector screen, I placed the Monitor C150 centre speaker between them, and the Monitor 50 standmount speakers were located at the sides and behind the main listening position. I placed the MRW-10 subwoofer at the front, away from the wall and firing forwards. Overall, the Monitors proved fairly flexible terms of positioning, which made the easy to set-up. I tested the Monitor Audio Monitor 5.1 system with a mixture of material ranging from Blu-ray and Ultra HD Blu-ray, CD, DVD-Audio, SACD and music streaming. My primary source was the Oppo UDP-203 4K Blu-ray player, and for amplification I used my reference Arcam AVR850 AV receiver in a 5.1-channel configuration. 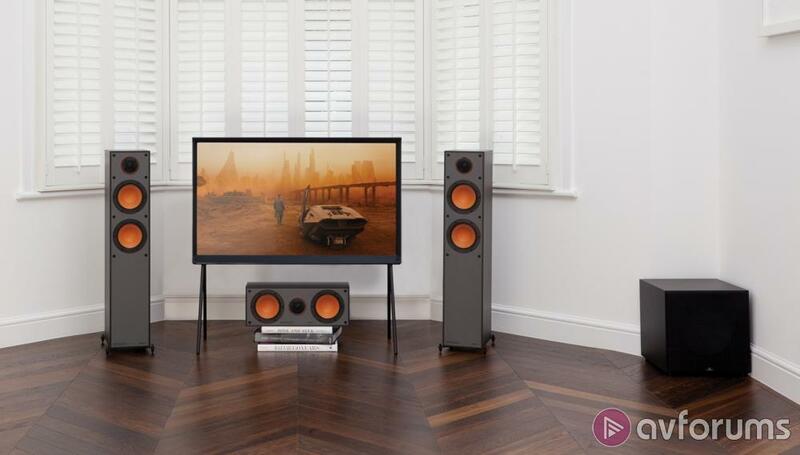 The Monitor Audio Monitor speakers may be pitched as entry-level models, and they may look a little cheap thanks to the orange drivers and trim, but there's nothing budget about their performance. The company knows how to put together a very capable speaker, and the lessons it learnt developing the Bronze range have been applied to the Monitors. I started this test by listening to some of my favourite music in two-channel stereo, so that I could get a handle on the Monitor 200 floorstanders. They didn't disappoint, delivering a very accomplished performance that exceeded any budget limitations. These speakers have a pleasing musicality that makes them ideal for two-channel, but they also have an undeniable sense of fun. That might be an intangible benefit and largely subjective, but I found myself really enjoying Kate Bush's The Hounds of Love, the Manic Street Preachers' Resistance is Futile, and Primal Scream's Memphis sessions for Give Out But Don't Give Up. These speakers revealed an ability to be both neutral and detailed, with a solid low-end presence. The top-end could occasionally be slightly bright, but overall this was an accomplished performance. To see how all five speakers and the subwoofer performed as a system, I listened to the 5.1-channel mix of Yoshimi Battles the Pink Robots by The Flaming Lips. The speakers all performed as a cohesive unit, delivering an immersive soundstage that surrounded the listener with both music and effects. There was excellent localisation of instruments, and some impressive detail retrieval. The Monitor C150 delivered the vocals with precision, and the Monitor 50s (which are excellent in their own right as a stereo pair) handled the surround duties with ease. The Monitor MRW-10 filled out the bass nicely, adding greater depth to the performance of the Monitor 200s. So far, so good – the Monitors had revealed a pleasing musicality and palpable sense of fun that makes this a great system for both two-channel and multichannel music. But what about TV dramas and movies? The Monitors proved just as capable here, applying all of the speaker's strengths to surround sound content. Watching Star Trek: Discovery, the 5.1 mix is delivered with a clarity and energy that immediately impresses. There was a real sense of cohesion to the system, with all the speakers sounding tonally balanced and effects moving around the room in a seamless fashion. The Monitor 200s produce a wide front soundstage, presenting the music with flair while also handling plenty of bass-heavy effects. The Monitor C150 takes care of the dialogue, remaining clear, focused and intelligible. The Monitor 50s are more than up to the job of delivering the surround effects, and the entire system works effectively as a cohesive unit. The use of the same drivers and tweeters ensures that there's a tonal balance to the system, allowing for a fairly seamless flow of effects around the room. 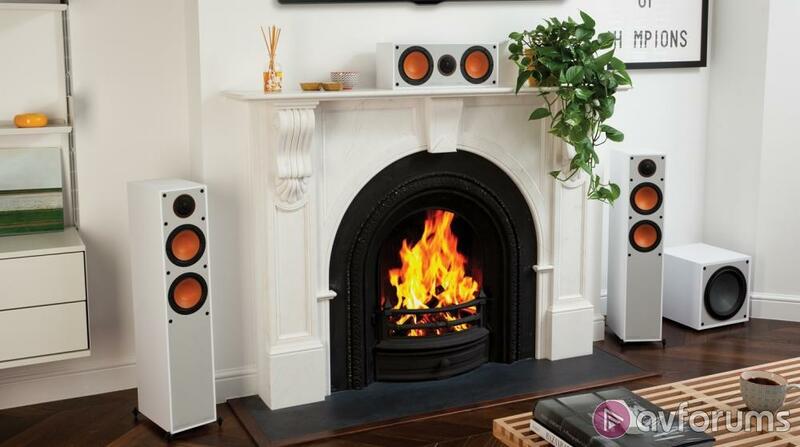 The centre speaker obviously doesn't perfectly match the front floorstanders, but all five speakers effectively blend into one another. The Monitor MRW-10 is also well integrated, giving explosions and other effects greater impact. My current go-to disc for testing a system's ability to be both detailed and dynamic is A Quiet Place, which has a wonderfully effective sound design. The Monitors live up to their name here, delivering the faintest of sounds with a pleasing precision. These are also responsive speakers that should prove easy to drive when paired with a decent AV receiver. This is ably demonstrated during the moments where someone (or something) makes a sudden noise in A Quiet place. The sudden jumps in dynamic range are impressively handled by the Monitors, as the soundtrack moves from relative silence to very loud in an instant. The sub also manages to handle the big bass moments fairly well, but if the system has a weakness it's the MRW-10. This subwoofer isn't able to mine the depths of larger or more expensive models, and it's a bit lacking in the power department. These shortcomings are fairly obvious during the opening bass notes of Edge of Tomorrow. However, the sub makes a good job of supporting the floorstanders during the beach assault, delivering bass that's tight rather than seismic. 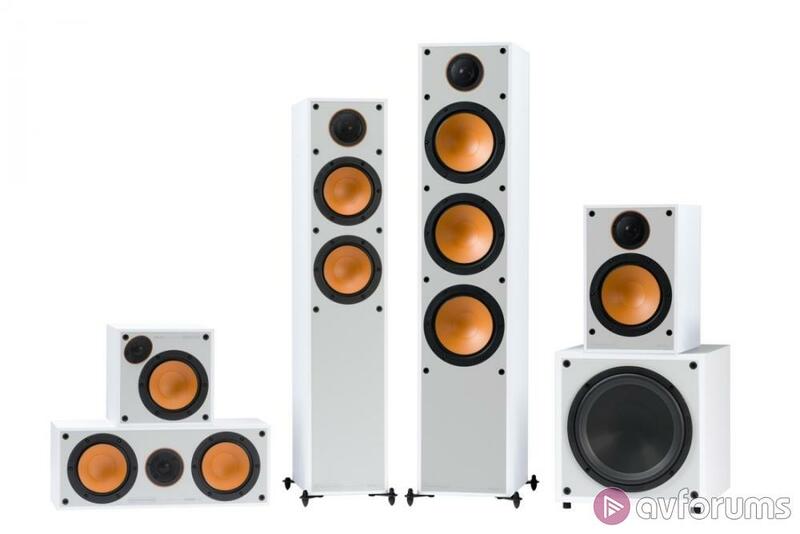 Overall, the Monitor Audio Monitors are an impressive range of budget speakers and you'll be hard pushed to find a better performing 5.1 system for £1,000, especially one that includes a pair of floorstanders. Monitor Audio's Monitor line-up is a cracking range of budget speakers that deliver both performance and value. The company has cut a few corners to get the price down, but the build quality remains solid nonetheless. The range actually looks cheaper than it is due to a somewhat pedestrian design and a garish orange driver and trim. However, there's nothing pedestrian or garish about the performance thanks to Monitor Audio trickling down innovations previously used on its excellent Bronze range of speakers. The result is a speaker that lives up its name, with a neutral and transparent performance that is free of discolouration. As a 5.1-channel system it also integrates well, creating a cohesive soundstage. 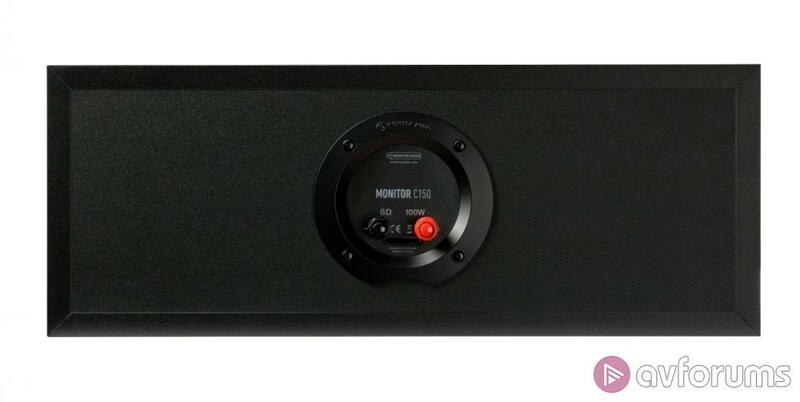 The Monitor 200 floorstanders deliver a solid front soundstage, the Monitor C150 centre speaker renders dialogue with skill, the Monitor 50 is more than capable of handling the surround duties, and the Monitor MRW-10 produces some tight bass. Overall, it's an excellent little system, although the sub is probably the weak link and unable to mine the depths of more expensive models. However, if you forget about the looks, the Monitor Audio Monitor 5.1 speaker package is an entertaining system that delivers real bang for your buck and comes highly recommended. 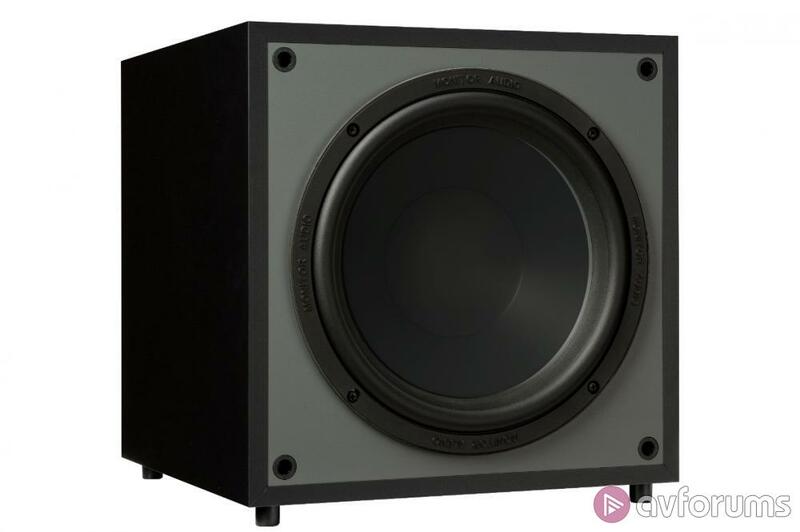 The Monitor Audio Monitor speaker package is an excellent set of speakers, and at a combined price of £1,050 it sits just below the two most obvious alternatives. 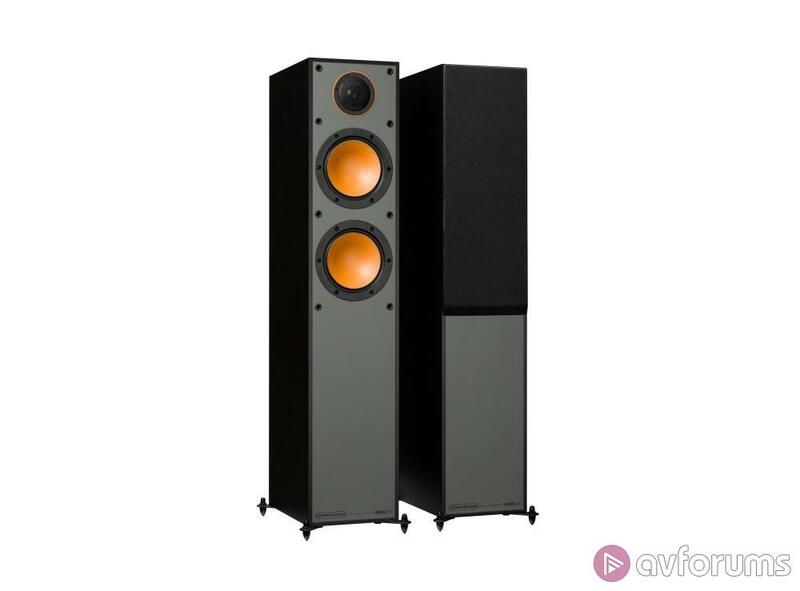 The Acoustic Energy 100 Series is a cracking choice but will set you back a bit more at £1,250, although for that you get a 5.1-channel system composed of two floorstanders, a centre speaker, a pair of standmounts and subwoofer. The aesthetic is modern, the build quality decent, and the performance is exciting and lively. As a result, this affordable speaker package a class act and worthy of recommendation. 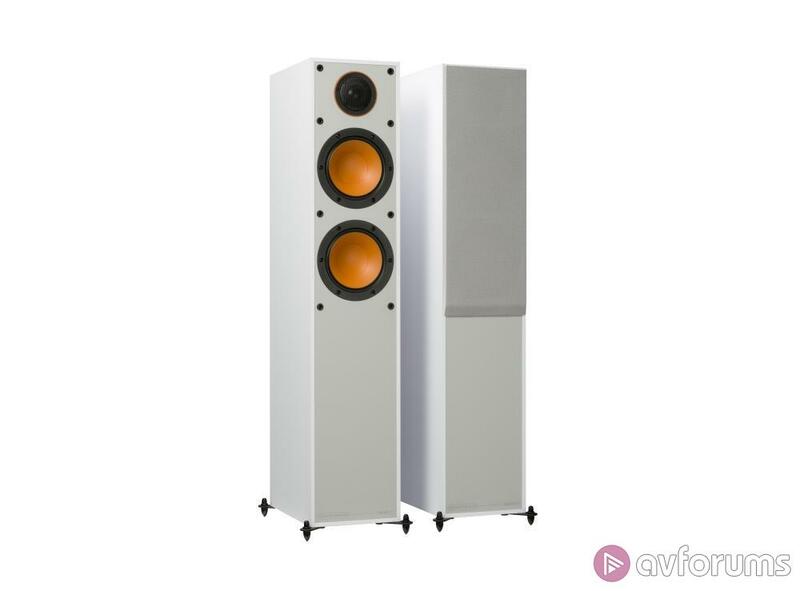 The Q Acoustics 3050i Cinema Pack also consists of a pair of floorstanders, a dedicated centre speaker, two standmounts for the rears, and an active subwoofer but costs a bit more at £1,350. However, this impressive system benefits from technologies first used on the company's reference Concept 500 speaker, and the result is a superb performance that makes this speaker package a definite best buy. Write your Monitor Audio Monitor 5.1 System Speaker review.